Planning a Hong Kong Visit? We sometimes receive queries from folks who are planning a visit to Hong Kong. Some are going specifically to visit historical sites connected with 'C' Force; others want to combine some history with what is in essence, a tourist trip. Hopefully you'll find some help on this page. Once you've been and returned, we hope that you'll let us know what your suggestions are so we can include them here. By the way, we envy you. You will experience the trip of a lifetime! Visit our Reading Room to get an idea of the reference books that are available. If you are limited in time and want the complete history including Canada's role, read Not the Slightest Chance, written by Tony Banham who lives in Hong Kong. Limited time? Read Tony's Historical Tour document. Check out the Veterans Affairs and Wikipedia sites. Looking for information on the grave of a battle casualty or POW death? Visit the Commonweath War Graves Commission site or our 'C' Force site. Spend some time browsing this web site. There are many gems here, especially the Personal Accounts, and Submissions. And lastly, try web searches - you'll be amazed at the results you get. Installing Google Earth on your computer will assist you in understanding locations and geography. One of our members, Mike Babin, has created a Google Earth Overlay (*.kmz) file that highlights the most popular spots to visit, and Allan Mondor added overlays of the battle maps on the area. We have also included an image of the area (from Google Earth) which has been annotated with major points of interest. Battle maps are available on our Gallery site. These are incomplete, and we hope to add more later. Weather-wise, December is the best choice. If you go then, you'll also see Hong Kong dressed up for Christmas! 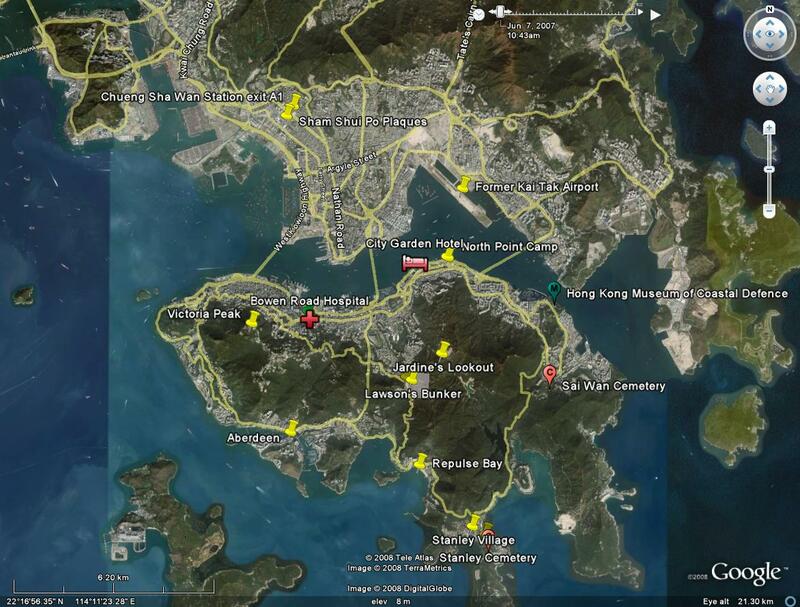 Staying on Hong Kong island, rather than Kowloon, will place you closer to most locations you'll likely want to visit. City transportation services are excellent (and riding on the Star Ferry is fun), so even if you stay in Kowloon you're still not far from the most popular sites. The HKVCA group that toured in '05 stayed at the City Garden hotel which is conveniently located in the North Point area on the island (see Google Earth overlay). Try the Airport Express train service. At HK$180 for a monthly return, it's a lot better than taking a taxi (which can cost HK$400 each way, if you're going to Hong Kong Island). If you intend to focus on the battle history it might be a good idea to hire a professional guide. We are attempting to publish a list of guides specializing in this historical area (see below). If you've made the trip and wish to recommend an individual or company, please notify us. Tony Banham (author: Not the Slightest Chance) is happy to help, but he has a full-time job which calls him away from time to time. Mike Babin has found a web site called Jason's Walks. The individual seems to be well-qualified and we would like to hear from anyone who uses his services. Another person who provides battlefield tours is Martin Heyes who was "discovered" by Mike Babin during the Dec 2010 visit. Here’s the description of his services. The company he represents also does other types of walking tours in HK. 1. Gunpowder Factory / Hong Kong Museum of Coastal Defence - Lye Mun Gap. area where the Japanese crossed to the island. Look for the plaque dedicated to the Royal Rifles of Canada. Battle Details. (photos) Location- MTR Shan Kei Wan Station. 2. Sai Wan War Cemetery (most Canadian interments) The first Sunday of every December there is a commemoration service, so this is an excellent time to visit. Anyone thinking of visiting then should check first with the Canadian Consulate in HK to be sure of the date and time. Location- Quarry Bay MTR, Island line to Chai Wan, exit A, taxi (20 HK) or Stanley bus. 3. Stanley Military Cemetery (photos) Stanley Bus, 5 minute walk out of Stanley town. 4. Wong Nai Chung Gap - One of the main battle areas once the Japanese reached the island. There is now a marked trail in place, allowing visitors to walk over this area, and gain an understanding of the geography and view battle points of interest. Make sure you stop at Lawson's Bunker (photos), West Brigade Headquarters (plaque) and Jardine's Lookout (see below) . Other points of interest: various pillboxes and Sir Cecil's Ride. We have reproduced the trail brochure on our site and included an overlay on our Google Earth overlay (see above). Bring good walking/hiking shoes! Location- Central to Stanley (get off at HK cricket club, or taxi). 5. Jardine's Lookout - The Wong Nai Chung Gap trail only covers the lowest west slope of Jardine's Lookout. The Osborn memorial (not to be confused with the one described in item 12 below) is off that trail, on a separate path which takes walkers to the top of the hill, and then on to Mount Butler. 6. Library at St. Stephen’s College - Hospital attacked by Japanese. Please note: You may find it difficult to see the library at St Stephen’s College. The college is a private school, and they may not entertain visitors. You should call them first and tell them why you are interested. They do have a very small museum adjacent to the library, but there are no plaques or other signage to indicate what happened at St Stephen’s or exactly where. 7. Shamshuipo - main Hong Kong POW camp (Kowloon- Lai Chi Kok Road- subway (MTR), head North, and get off at the Cheung Sha Wan stop). Note that there is nothing left of the POW camp itself. There are plaques, however, to commemorate the location at one end of the park you’ll find there. 8. Shing Mun Redoubt - (Gin Drinker's Line) Website: Shing Mun Visitor Centre. The centre has on exhibit a very good diorama of the Redoubt. To get there take the MRT to Tsuen Wan and take a taxi, or a maxi-cab as described on their web page. To get from the centre to the Redoubt walk around the reservoir in an anti-clockwise direction, when you see a big overhead sign marked "MacLehose Trail (Stage Six)" leave the road and join the trail - the tunnels start about ten minutes after the sign, mostly on the left-hand side of the track. Remember to bring a flashlight and water and be prepared to climb a VERY long flight of steps! 9. Bowen Road Military Hospital - Many Canadians were there during the fighting, and it stayed in operation treating the seriously ill until almost the end of the war. The address is 10 Borrett Road. 10. North Point Camp. Information and Photo from Mansell's site. Map from Tony Banham's site (scroll down) The area that was North Point Camp is now primarily an open park, crossed by a road with a netball court on the other side. Again, there are no memorials. 11. Argyle Street Camp. Opened for officers in Apr '42. Read more from Tony Banham's site. Argyle Street Camp was roughly where the Hong Kong Eye Hospital is today. Nothing marks its previous use.